To all my fans, friends, family, and prospectives: I’m excited to announce Book 2 in the Chronicles of the Way & the Darkness is available with all the major retailers. Exiles of Heaven picks up with Lord Fallondon Breck and his company of knights recovering from an attack by the demon Baal and his followers. Struggling to resolve the demonic conflict breaking into their world, Fallondon and his friends realize the only way home is forward toward unknown enemies from both sides of the torn Veil. As the armies of Hell march toward Old England, angelic allies rally beside a band of brothers who fight to defend the helpless. Many thanks to those who helped with beta reading, proof, and interest in the characters! I’m working hard to get Book 3, Map of the Stars, out soonest. 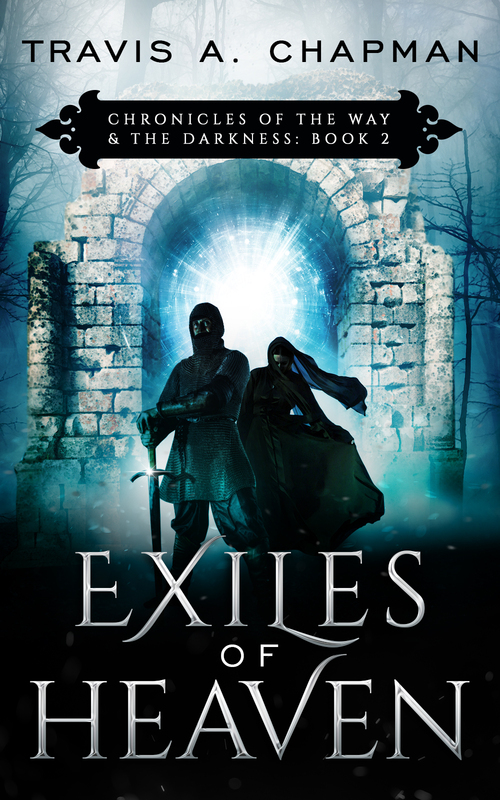 In the meantime, I’ve included several chapters of Exiles of Heaven below for anyone interested in a free preview. Enjoy! But every now and anon a trumpet sounds from the hid battlements of eternity. The plain was eternity. A vast darkness spread overhead, punctuated with countless stars. It was a sharp contrast to the white sand stretching across the desert below me. Far below me. Like a hawk lazily riding warm currents, my mind glided over the stark scene below. Even at this elevation the white sandy floor kept going as far as could be seen. No markers broke the view, no rocks, no trees or scrub, nothing. Just pure white sand. A starry canopy was stretched overhead. As I swooped down closer, individual grains of sand caught hold of the celestial illumination and sparkled. The sky was a dome strung with brilliant gemstones, like a fine net of pure starlight. With the ground in near view, my speed became apparent. Sand became a blur as I flew faster and faster toward the horizon. Something drew me like a beacon, a watchtower signaling all around it in the darkness. Just across the rim of my vision a bright white mote of light shot up into the night sky. The brilliant pearl climbed and climbed, reaching for the stars above. For a moment I thought it would fall back, but it continued straight away. I’d seen firepots flung by great siege engines during the night yet this flare showed no signs of stopping. In seconds it was indistinguishable from the stars treading their silent dance. What could communicate with the heavens above like that? It was faster than any falling star, yet it ascended the heavens. My consciousness pondered the question as I raced toward the source. I broke over the horizon and beheld something terrible. Rank upon rank of hideous creatures spilled across the plain. Demonic faces filled my vision. Tiny figures rode the edges, their scaly skin shimmering with the sand’s reflected light. Pitchforks and spears waved in the air about their wide-mouthed grins, pointed teeth and serpentine tongues smiling. Company upon company of tall soldiers wrapped in darkness and moving together in beautiful synchronism. My mind revolted at the sight of men with eyes but no faces. Taunt flesh covered the space where mouths and nose should have been. I felt part of my soul rip away when their gaze caught mine. Evil, hideous eyes. The bulk of the force was an ethereal collection of soldiers. Thousands of insubstantial spirits marched in file. To my eyes their appeared as ethereal figures of mist and smoke. Insubstantial in form, yet clearly having power over the material world. Banded armor, pugils, javelins, and sandaled feet spoke of the Roman legions that once held my world in their grip. Their restless souls felt deathly silent, grim, and determined. Hulking human-like figures marched in the rearguard. Several hundred of them. Their muscular forms were wrapped in iron plates, feet shod in thick boots. Wicked weapons bristled from their company, hooks and spikes and jagged edges marring already deadly instruments. The worst aspect were their heads, faces of lions with powerful jaws and teeth visible around fur-covered muzzles. They looked ravenous. I wheeled around in the sky overhead, still taking in the army below. While the main and rearguards were formed of soldiers marching in rank, the vanguard was made up of a disparate collection of beasts. Off to the side was an enormous creature, like a beetle the size of the castle at Acre. Huge mandibles clicked before it, its bulk born by six carapaced legs digging in sand with each step. Armor of chitin and foul, unclean substance swathed the creature like an insect. Movement caught my eyes. Serpentine forms swooped around the army, great bat-like wings scooping the thin air and hurling their snake-like bodies at great speed. They wore a feminine grace about them, all lean curves and deadly beauty. Long spears born by heralds preceded the leaders of the army. Black banners hung limp in the still air. Dark pennons drooped like ink blots spilled over parchment. The lieutenants rode jet-black horses with dim red eyes and their breath fogging ahead. While their riders looked human, I knew they were anything but. A woman with flowing black hair, her beauty so great that my breath caught. Her dark dress left little to the imagination. A scent of sickly sweetness caught up in my nostrils. A smell of decay mixed with honey. Two lords clad in darkness rode near her. They emanated great strength and power. My stomach threatened to lose itself from fear. Tooled scabbards held swords by their sides. Cloaks of whorled colors, deep purples, blacks, and greys flowed over their shoulders and masked their figures. Ahead rode another like them yet different. The standard bearer wore armor of iron plates, dull and dark. His visage was masked by a great helm with wicked horns twisting forward. I wondered where costume ended and monster began? A fell captain rode at their head. There was no doubt who he was. A slim figure clothed in darkness, his pale skin complimented the sand around them. His cloak swirled in living whorls of inky blackness to wrap his form. It recalled distant memory, like the ink from a monk’s quill dipped in water. He rode atop a nightmarish coupling of creatures. Like the monsters of ancient stories it wore a long toothed snout atop the muscled body of some great cat. It reminded me of the crocodiles I once saw in Egypt whilst on campaign, but covered in course fur. One of the old gods worshiped while the Israelites were yet slaves of that nation. I did not want to, yet my form was compelled to answer and circled in closer and closer to the captain. In an instant he reached out and grabbed my invisible form. I saw no flesh in his hand, nor anything of myself, yet he held on with crushing strength. His grip tightened. Despite my ephemeral form, I fought to take in breath. None would come. He drew me before his eyes. Deep tunnels of obliterating darkness bore into me. A charge of banked coals sat deep within that pulsed with crimson light. Like a passage straight through the blackness of the world and into Hell itself. An explosion of light blinded me. Pressure pounded my body and mind as if an ethereal blacksmith forged away at the little iron of my soul. Then I was racing, faster than a falling star, accelerating as I raced toward oblivion. As if from a great height. Once again my night was marked by restlessness and terror. After my first encounter with the demon, Baal, I hadn’t known peace more than a few fleeting moments. His hideous aspect remained stamped on my memories. The trials of the road did little to help. We had recovered from the fight in the grove. The aftermath was a company of knights on edge. Knights jumping at every sound and seeking enemies behind every rock and tree. All waiting for a new despair to fall upon us. One day bled into the next through the pine forests separating Breckshire, my home, and Wolford. At long last, the road was nearing its end. Not even a fortnight ago my thoughts were bent upon simple things. How to prepare Breckshire for our departure and the journey back to the Holy Lands. To Outremer. My heart was set on reclaiming the glory and treasures we had been denied years before. Restore Breckshire to its former state, a rich land filled with hearty people. Opportunities for my knights to win renown. In England, my adversaries were flesh and blood, neighboring lands with jealous hearts and voracious appetites. Surely Garret and Brenna would take up their roles in the family, defend our own. Daemarrel and Ardglass could be managed. Demons, however… Now I wrestled with the reality that our plans were wildly changed, my desires and perceptions changed by an encounter with one of the angelic host. We sighted Wolford just past noon, three days after my encounter with Baal. Three days after our fight with the masked foes. Whilst we believed the distance could be made in a hard two days, we did not expect to lose time with a hackney throwing her shoe. Horses. Never could rely on the animals. Worse than the trouble with the shoe was the challenge of finding someone to fix it. Thomas had most of the tools, but any good ironmonger or farrier could have provided a better kit to do the work. We spent most of a day riding between homesteads looking for one. We saw little but empty farms, their mud-daubed sides collecting spring warmth, their thatch wearing thin from disrepair. Occasionally, some animals wandered about, left behind, but no people to be seen. No carles about their work. No children chasing geese. No boys following their fathers about their work. All we found was a troubling sign. The sigil. We first noticed it two days earlier as we left the confines of pine forest for pasture and crofts. First a homestead off the road, then more and more doors bore a splash of whitewash. Simple lines, a triangle and hashmarks encircled. A pentagram? Something else? No one could place it. No one saw those who scribed it. No peasants seeding the spring fields, no herdsmen out tending cows, no shepherds in the field to ask. Just door after door bearing a white mark. It wasn’t until the low hills gave way to a plain and Wolford came into sight that signs of our pastoral economy returned. The fields rolled in gentle waves all the way down to the river. We were mariners riding a verdant crest, gazing across green waves stretching from horizon to horizon. The smell of grass filled my nose with its sweet scent. Before us now was the safe harbor we sought, Wolford. “Baldur, what are you sniffing at there? Anything to share?” I caught a quick glance as he hid whatever it was in his bracer, tucking it between metal and forearm. Hart’s mount sidled up next to mine. “Must be powerful to overcome yer smell, Fallon. No one wants to say anything, but ye could use a dip in the river.” Hart laughed in jest. He needed the same treatment. Saxon humor at its finest. Baldur blushed. “Something of Elaine’s, that’s all m’lord. A token for my travels. I miss her from time to time and this little strip of scarf helps. She kept lavender pressed between the folds. The scent reminds me of her. Of Bethany too.” The old man smiled beneath his grizzled cheeks. We all teased him ever since he courted and married his beautiful French bride. I could understand the need to center oneself when the world threatened to fall apart around you. Loved ones were certainly part of that. His wife and adopted daughter were the center of Baldur’s world. “Nothing to fear, Hart. If we suspect anything like we imagine, staying near at hand to defend our people is more worthy than anything we’d find in Jerusalem. No amount of gold nor gems could replace our people. We must ensure their safety first.” Safety from an unknown, unexpected threat. A threat I could not manage myself. Baal’s cryptic words lingered in my mind. What was coming against us? What could men like us do? Tadessah unfurled our standard as we neared the town gates. Thick trunks of pine made a sturdy palisade around a collection of plain warehouses and homes. Wolford lay on a bend in the Oster River, a town built of the forest surrounding lush farmlands. Brown tones blended together as wood and riverstone structures filled our vision. Small patches of vibrant grass and wildflowers added color. My father always thought Wolford idyllic, a quiet respite when traveling abroad. I saw it as a rock to cling to in the midst of a storm-wracked sea. A place to catch our breath before plunging into cold water again. “I can’t help thinking about what happened, Fallondon. Masked marauders, demonic intrusions, an angelic visit, and now a sigil. It is like the world is holding its breath. I saw evil during my travels, but nothing like this. You put my homeland to shame. What is going on, m’lord?” Tadessah’s punctuated accent made me smile. The Ethiopian was a hard knight, yet recent events unsettled even him. “I wish I knew, Tadessah. Your fears are rightly placed, and the question of what to fear is still before us. An unseen foe of the spiritual realm? Masked men and women in black dress? Who can tell? Our enemies in Outremer came at us straight on, but this feels altogether different. Hopefully, the town master knows more. Hard to believe Orderic wouldn’t have some information about the state of things. Besides, a straw mattress won’t go amiss. Too many nights abed on the ground, eh?” I raised my hand in salute at the gates before us. A maille-clad watchman returned the gesture. I didn’t share my own confusion with Tadessah. After the events of the past week I felt more distressed and anxious over keeping my men safe, protecting our lands, and returning to my family than ever before. They would be looking for leadership that only I could provide, yet I felt inadequate to the task. Such a strange dichotomy. I grated at the call. I’d never felt comfortable hearing all of that strung together. To these men, to my family, I was just plain old Fallon. Two men outside the gates lifted their spears in salute. Neither wore much to speak of, only simple leather jerkins and steel caps. In times of peace the watch had little need for more. I spied movement in the barbican above. The wooden gates swung open a few minutes later, time enough for our train to have caught up in a clutch outside. The strength of Wolford was apparent in the thick oak beams crossbracing the doors, a solid deterrent to any trying to break through. I recalled that a moat was being dug out on the northern side as well. No small undertaking for such a small town. Breckshire wasn’t much larger in size, but Wolford had existed longer and showed the diligent stewardship of capable hands. The people were strong and industrious, a tribute to our lands. I struggled to hear this. How close had we come to anyone in the past few days? None of us found bodies, and I couldn’t recall any of our company affected by ill humors. “Thank you Brent. I think we are safe from what I know, but we’ll bear that in mind. Please go back to your work. We’ll find our way now that we’re here. You no doubt have important matters to attend.” Important work like ignoring clear signs of trouble in your master’s demesne. Cynicism rose like oil over water within me. Brent made his obeisance, touching his maille coif and saying a firm, “Thank ye, m’lord,” before stepping back to the gate house. A soft peel of thunder announced the great oak beam dropped into place and locking us in. The great iron hinges and strapping made me feel secure. At least as much as I could feel that way with current events on my mind. Inside the gate a broad open space opened where travelers or defenders could orient themselves. The streets were packed earth, rutted with the travel of high-wheeled wains common in our lands and trampled by both animals and men. The smell of dry manure swept past us on a breeze scouring the nearby stables. Whilst not as dirty as some places, Wolford had the same collection of chickens, goats, dogs, and other beasts adding to the local color. Most fearsome were the bare foot children running amok and splashing up water from horse troughs. In the warm spring air it must be a welcome respite. A few townsfolk, mostly women, wandered the streets with baskets and sacks of laundry, vegetables, and other domestics. No different than any other village or town across the Broads. “That’ll do. See to it, and let’s not make the same mistakes again, eh? We want to make the return journey without delay.” Thomas blushed and returned his hat after a bow. Baldur shot arrows at me, a silent warning that my barbs were too sharp and unwelcome. Well, I certainly wasn’t responsible for shoeing the horses so poorly in the first place. Nods passed between us, a collection of ‘Yea m’lords,’ and we broke our separate ways. I passed Starchaser’s reins over to Helfric as Baldur and Hart did the same with their mounts and Sheldon. Our squires were good lads, well trained with horseflesh. “Fallon, any word for us?” Hart brushed his cloak back, dust falling away. The heat sucked moisture out of the air and turned the roads into endless desert paths. You’d never know we’d had rain only days before. Standing next to me I had to look up into Hart’s eyes. Even with rations on the road he still loomed over me and looked so full. His constancy was a small joy for me. I didn’t know how I’d survive without him, closer than kin and loyal to a fault. “I thank you for that, friend.” I did not feel all that thankful. Paulson dusted off as he approached. Everyone else’s blue tabard and cloak looked like mine, a mix of caked dirt and debris clotted on the hems. The woad dye was tolerant of such things, but would surely lighten if we gave them the heavy washing they needed. Paulson’s Templar white looked more like russet given the stains. We were pack of mongrels to observant eyes and hardly the trim knights one might expect. Josephial’s glorious angelic radiance was dimmed. He pulsed with an inconsistent light that reflected his emotions. Too many things all happening at once, and here he was approaching his superior for help. How could he explain any of it? The walls of the garrison passed by with hardly any notice as he focused on the task ahead. Crowds of his peers gathered, looking down from the balconies rising story upon story overhead. The great atrium rose like a fluted vase, twisting in long lines to an opening far above. The Heavenlies gave off a consistent, warm, and breath-taking light. The source, all around them yet reaching for eternity, pulsed with the beat of Creation. Its constant presence spoke to everyone gathered within, including the warrior just returned. The Citadel of Beriah was astir with energy. The angel host were on edge. Whysper threaded her way to Josephial and buried herself in his chest. She drew him into a deep embrace, tears flowing down her perfect face. Josephial cracked a smile and pulled her in tighter. The tall angel turned his head. His dark skin wouldn’t blush, but Whysper saw the sting of shame in his eyes. “What?” Her words echoed up the atrium and betrayed the strong emotion and surprise behind them. Others began to notice the pair as they approached the far side of the hall. “Quiet. I fought Baal. I saw him in that cavern, down in the press but near Azrael. I haven’t seen many of the great ones together like that. The best information we had said Baal was still assigned to Amayon’s cardinal forces. I saw him there though, as well as Lilith and Molech. There were others I recognized too. They were not part of Azrael’s cohort to begin with. Certainly not Baal. Josephial thought back, remembering the fight. “I am. He was no longer in the Heavenlies, nor Beriah with us. Fallondon could see him. He fought him. He must have been dreaming. Baal was certainly in Zirah then. But that doesn’t make sense?” He hadn’t thought of it too much up till now, but the matter confused him. He stopped and looked her. Her radiance shone brightly, even among a host of angels like her. Josephial had fought beside Whysper for millennia. She was as near family as anything, though not like his lost brother Adonael. She gave a grim smile. Satisfaction at being right mixed with frustration at the truth she revealed. Josephial processed the information. Everything began to make sense now as pieces fell into place. The sacrifice. The energy. But Baal’s place in it? Still no answer there. Tadessah and Malvyn organized the rest of the company after Fallon departed. Fulcher and Hugh were quick to pass off their horses to the squires and head down to the riverfront. Wolford’s stables were all near the main gate, so getting the horses situated was an easy task. The typical collection of young boys scampered here and there, changing straw in the paddocks, tossing fodder from the loft down into waiting baskets. Orderic’s animals and those of the more affluent in Wolford were good companions for the company’s crusading stock. The town’s farrier was a jovial man named Tim who took an instant liking to Thomas and Gregory. The pair were quick to unpack their panniers and get to the work of shoeing horses. “None today. Just the same worries all men have. We all fear change. Difference. To ground ourselves we compare. It comes much easier than acceptance, but I fear it not.” Tadessah unbuckled his scabbard to position it against his waist. The curved blade rested easily there before he swung his own panniers over his shoulder. Like the others he wore sturdy garments for travel though unique to his culture in color and cut. A vest sewn over with heavy rings caught the day’s light and chimed as he shifted his load. His black hair and beard were speckled with the beginnings of grey hair, all setting off his dark face and sparkling eyes. A withered husk of a man sat before me, withering further under my relentless questioning. Paulson, Hart and myself all sat at one side of the great table in Orderic’s hall. The room was large for such a small household. No doubt at some point it held many families. Now it was just Orderic and his children. The man’s wife had died while I was in the east. His sons and daughters were grown. Only three remained behind, a son and two daughters. One for the spear, two for the cooking. The younger poured wine from a clay jar. None would say she was beautiful, but her smile betrayed a simple satisfaction with her duties. Her older sister stirred the noon meal over a banked fire. Both wore the familiar features of their mother, now a memory from my youth. Orderic’s house was certainly peaceful and a reminder of my innocent past. Blue eyes stared back at me from his craggy face. A dark bushy beard masked many of the lines carved with age. Gray hair sprinkled throughout marked his many years, and from the gut hanging over his wide leather belt one could guess many meals as well. Father had trusted him though, and after years in our service I had no reason to feel otherwise. Paulson rose and received a refill in his cup, then switched sides to sit by Orderic. His Templar tabard hung from the man’s fit form with ease. He was completely relaxed to my eyes. Subtle in the Templar way, but well timed. I was targeting the man with my ire. Paulson began, “Fallondon, maybe it’s just not the answer you want to hear. Do you believe people are trying their hardest? We’ve had our own troubles as well, and I don’t recall anyone sending out missives to the outlying people. All of the holdings are under threat. The question remains the same. What will we do about it?” Paulson was calm as ever, even when challenging me. “I know, friend. I don’t judge you or any here. We are seeing the same things. A larger threat seems to be growing around us. Filling in the emptiness we often forget is there. Think of the men who attacked us. It’d be easy to assume we’re all insulated from the wider world, but things are more connected than we know. News travels. I wonder if Daemarrel is planning something more organized against us, or are they in league with Ardglass. Now that would be terror.” I knew it was true. The combined strength of those lands, pinching us between, would be difficult to challenge. Impossible, really. Who knew if there was a connection between the attacks here and my encounters with the angel Josephial in my dreams? I blushed, but nodded and began my tale. Orderic listened carefully. His daughters, sitting just outside the fire’s shadows, could not help but listen too, and I caught their heads turned toward me more than once. How silly I must sound. A grown man telling tales of monsters from a chapel prayer book. The old man stared at me as I finished, weighing me in his mind, no doubt. The attack in the grove by masked men was at least plausible. Few rational men talked openly of demons. Even our friars and priests rarely made commentary of the subject. Who was the boy imagining things now? I didn’t expect what came next. “I know Sir Paulson is your chaplain, so he has undoubtedly spoken to you and prayed. I too have found our brothers of the cloth. I have had similar dreams of late. This creature, you called him Baal, well he has visited me too. I see him with a group of followers, a coven of some sort, who worship him in thrall. I feel like he is preparing them for something. At least, that is the sense I have. Who can say? As a young man I longed for pitched battles to prove myself. Now I worry about watering myself in bed, waking in sweat to terrors like this. It shames me, but there’s the truth. I believe you Fallondon. Now, what will you do?” His daughters were blushing at his words. Honest and frank. I smiled, “Be that as it may, I’d rather meet my enemies with steel in hand than words on my lips. Your people can do their part, Paulson. We all need His protection.” I knew Paulson was right. That didn’t mean I liked it. Milksop priests and fat friars babbling words into nothingness. If God was real, then He expected us to take care of ourselves, that was plain. Father never said it quite so, but he was always a man of action first, a man of the church second. The past fortnight gave me no excuse to change that. Orderic had the same look on his face and nodded at me. His daughters blushed a bit, but said nothing. Prayer was important, but action was vital. I knew of no words that stopped arrows. “What else is there? Are there options to speak of? What say you friends?” I felt good with the discussion thus far. Bringing our strength to bear seemed like the best thing.